Moving. We talked about it for several years. And then, we did it. We actually moved out of the town I’ve lived in for 48 years, and the home I’ve raised my family in for 26 years. I’ve always loved my hometown. It’s beautiful. The streets are lined with sturdy mature trees. The old homes are gracious, each one unique and original. Ours featured the charm of hard wood floors, original moldings, warm fireplaces, the natural comfort and coziness of a traditional home. We lived just a few blocks from our town center where we often had breakfast at the Cozy End. I’ve walked those streets countless times with babies, toddlers, and then teenagers. Over the years, the Meyers 5&10, Bonds Ice Cream Store, and Markers Bakery have yielded to The Gap, a Starbucks, and Williams Sonoma. But it’s still our little Uptown center. It’s still my neighborhood and it took me a long time to be ready to leave it. Long ago, my husband and I made the decision, despite crazy high taxes, to stay in this town until all of our kids completed high school. We loved the diverse, multicultural and multi-ethnic character it has long been known for and which was part of my experience growing up. It was time. Time to downsize. We didn’t have a huge house, but no longer needed three floors plus a basement, and four bedrooms. The house needed costly care and upkeep. And we definitely didn’t need to keep paying the high taxes. I knew the time would come to move on, but at first, it was just too much for me to consider. Everything was changing. I was afraid of losing the things that identified me. Made me sure and steady. Gave me purpose. What did the future look like? If I wasn’t prioritizing my family, what was I prioritizing? If I wasn’t the day-to-day “mom,” who was I? If I wasn’t living in Montclair, where I had almost always lived, where would I live? And where would Christmas be? I was the keeper of the family Christmas…if not here, then where? So it took a while. I told my husband that, rather than live in this strange neverland of one foot in my old home and the other on the path to the unknown, we should come up with a solid plan. How would we prepare the home, freshen it up to make it ready to sell? What would be the process of getting rid of all the stuff we had accumulated over the past 26 busy years? 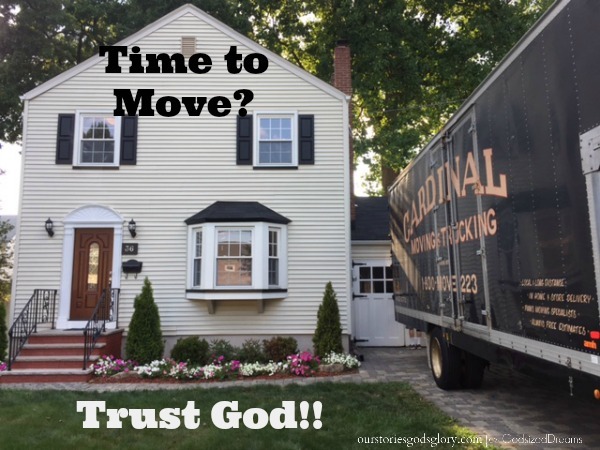 When, really when, did we want to move? Oh and where? The idea of heading for the coast intrigued me and struck me as a potential grandchild magnet. My husband loved the idea of immersing ourselves in Philly, where two of our children and our grandchildren live. Or, was it too soon to make such a change? Maybe we’d just move down the street a bit to a neighboring town. I began to run out of good arguments for staying. The taxes increased. The house wasn’t getting any smaller and still needed repairs. I couldn’t hold on any longer. So we met with our realtor and put together a plan of action that would take advantage of the spring real estate market. I was overwhelmed by a sense of peace as we moved forward. We painted more walls and even installed granite countertops and subway tiles to spruce up the kitchen. We cleared our home of personal touches, like photos and tchotchkes, and got rid of about 1/3 of our papers, books, memorabilia, glassware, and sports equipment. We stored half of our furniture in the garage. This was really happening!! After determining we’d stay in the area, but not exactly sure which town, we began looking around at houses to buy. When our house went on the market, it sold within a week. It was time to choose our new home. During the last few weeks in our old home, I sensed God’s reassurance. He spoke right to my heart, through His Word, as I read devotions. He was doing a new thing. He was able to do immeasurably more than I could imagine. He would never leave us or forsake us no matter where we lived. So what does this have to do with God-sized Dreaming? We have to trust that if it’s time to leave a dream behind, God has something better ahead. Are you thinking it’s time to leave your dream behind? Take time to reflect. Where have you been and where are you going? Seek God. He’s got a plan and His timing is perfect…and He will speak. Take action. If it’s time to move in a new direction, be brave and trust that God will be with you no matter where you go on your dream journey. Note: You can hear more conversations about Letting Go on the Circles of Faith Slices of Life Podcast. Join us! Do You Ever Question God?